News at the Stronghurst Booster Club was well received by those present at it's July 7th meeting. 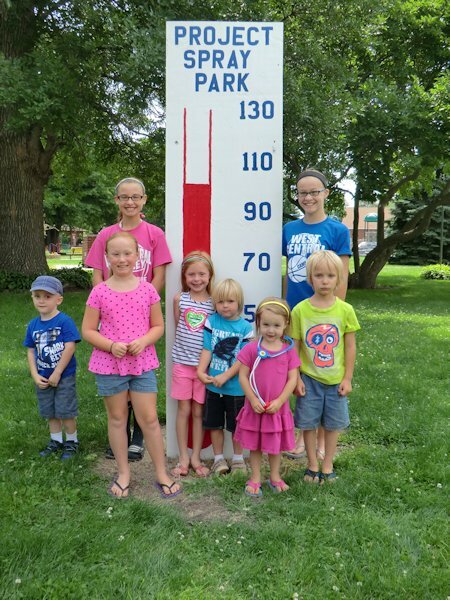 Treasurer Jerry Keimig reported that following the 1st annual Dr. Robert Pogue 5k run, and activities that followed, the total raised for the Dr. Robert Pogue Memorial Spray Park climbed to over $99,000. The goal of $130,000 has been set, and that goal should be reached by early spring. When the goal is completed construction will begin immediately. Beginning with an idea presented by the young visionary Jade Parker to the Stronghurst Village Board in August of 2011 and continuing with the idea to memorialize one of Stronghurst's most respected, most loved, and most supportive citizens, the Dr. Robert Pogue Memorial Park is close to becoming a reality. Although much has been accomplished, there is still much to be accomplished. The next 5 months will bring several new opportunities to help support this wonderful and healthful way to provide more good outside activities for the young children of our community, as well as to pay tribute to Dr. Robert Pogue who gave so much to our community. What better way to say thanks to a great doctor, a great father, and great beloved citizen of Stronghurst then to memorialize him for years to come by completing this project and providing this wholesome activity for our children. $5000 Raffle- selling of raffle tickets for $25.00 will begin during the Henderson County Fair. September 27th and 28th Tour of Homes 10 a.m. to 4:30 p.m. If you haven't given and would like to do so, find a way, all donations big or small will be appreciated. We are aware that the $30,000 will be most difficult, but we have tremendous faith in the citizens of Stronghurst.